Spawned in Germany during 1984, KMFDM pioneered the crossover between techno/dance and heavy metal with their signature industrial sound. Moving to Chicago in the mid-80's KMFDM was the pride of WaxTrax! Records during the label’s peak. Rapidly evolving year by year through intense experimentation and touring; the band has redefined themselves with each new release. 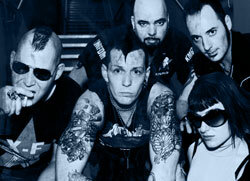 Venturing on to dabble in side projects and then re-establish KMFDM in Seattle during 1999, Sascha’s revolving band of misfits have stood the test of time. KMFDM is currently helmed by the dual vocal attack of the band’s founder / leader, Sascha and the siren-voiced Lucia. To quote themselves, “The future belongs to those of us still willing to get our hands dirty”. Living by their D.I.Y. philosophy, KMFDM has launched their own online store, KMFDM Store (www.kmfdmstore.com) and record label, (KMFDM Records). KMFDM remain a musical entity to be reckoned with. Through relentless musical exploration and reinvention they have continued to top themselves. KMFDM’s forthcoming 2009 album, Blitz, is no exception. And now KMFDM has announced . . . Skold vs. KMFDM! Skold vs KMFDM is the new 22 track album by Tim Skold and Sascha Konietzko. It will be released early in 2009 on KMFDM Records exclusively through the KMFDM Store in fan-friendly CD, audiophile Vinyl and high quality MP3 formats. As further evidence that their 25th year, 2009, will be one to remember, the band are set to hit a number of festival and headlining dates across Europe. Then they will make their way back to the US and Canada for more stops on the Kein Mitleid Tour 2009. In addition to their new material KMFDM has re-released their entire back catalog from the band's WaxTrax! Records era as KMFDM Classics via Metropolis Records/KMFDM Records. To accompany the KMFDM Classics, KMFDM has released Extra, a three volume set of double disc collections of all KMFDM tracks not included on the ten KMFDM Classic albums. The classic KMFDM side project Excessive Force has also had their entire catalog re-released. As can plainly be seen, the self-proclaimed fathers of industrial-rock show no signs of stopping.